Some skaters would rather get their teeth drilled than lift weights. 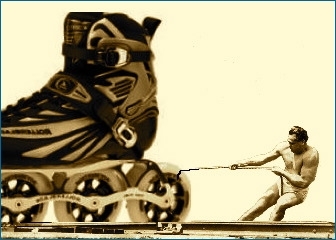 But more and more of us are finding that weightlifting can pump up our skating. Some skaters perform a full range of lifts to build their leg, back and arm muscles. Others pick and choose. I, for instance, find that leg lifts cause my muscles to lock up while skating. So I skip those. The trick to weight training is to make it relevant to your sport. Think of it not as a way to build muscles but as a way to strengthen muscle movements. Then design a weight program that mimics the way you move when you skate. To see how this works, let's start with the squat, one of the best all-around exercises for building leg muscles. In optimal stride position, skaters sit low, bending their knees to form an angle of 90 to 135 degrees. So that's what we want to mimic with our squats. The full squat - Skaters do better with the half squat. Standing up, bend yours knees, slowly lowering your weight until your thighs are parallel to the floor (knees at a 90-degree angle). Pause for about two seconds. Then rise a little until your knees and calves form an angle of about 135 degrees. Do 6 to 16 repetitions. (And if you like, another set or two.) Do this two or three times a week. Squats can be done with or without weights. Start without them, then add them when you're ready to, uh ... raise the bar. You can add weight by placing an Olympic barbell across your back or by dangling a dumbbell from each hand. You can also use squat machines at your local gym. Any method is good and variety is even better. Another effective way to do squats is with a dumbbell and an exercise ball. You place the exercise ball against a wall and lean your lower back into it, keeping it pressed against the wall as you move your body up and down. The ball keeps you in proper skating position. Here's my tip on lunges for skaters.